Another set on Flickr, uploaded by LisaNH. For my second attempt at spinning fiber, Princess and I tried the llama fleece from their first and only shearing, in the spring of 2006. I found it spun differently than the Icelandic roving, which is interesting, because they are supposedly a similar micron count. I think I might just be getting the hang of it, though, and it just seemed to spin up thinner, finer. Who knows. The llamas are such dirty girls, though! This stuff had enough hay in it for a spare meal or two. I knew it would be like that, because boy do they like to roll in the dirt. They especially like to have all four legs straight up in the air, and grind their back in the ground, over and over and over. It took a long time to get this stuff clean enough to card. I like the color and the texture a lot, though. I think I’m going to spin up another bobbin full, ply it, and then make something from it right away, just so I can see what it is like to crochet with my own stuff. I know that some people put dye on top of naturally colored fiber like this, and I’m trying to decide if I want to try that as well. I think I should attempt to dye on my white Icelandic stuff first, though. Baby steps. 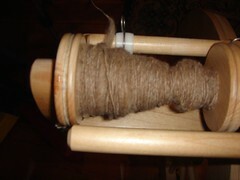 This entry was posted in Carding, Fiber, Llama, Plying, Princess, Spinning. Bookmark the permalink. Post a comment or leave a trackback: Trackback URL.